I love Darwyn Cooke’s DC: The New Frontier. I think it’s a love letter not just to the superhero genre, but also to its medium: the comic book, even though my 520-page 2016 paperback edition neither looks nor feels like a floppy when I pick it up to read. There is a sequence in The New Frontier that particularly resonates with me. The Martian Manhunter (J’onn J’onzz), disguised as John Jones, goes to the movies. On screen, a “Martian” appears. From his point of view, the “alien” looks like “a big green potato.” He laughs, but soon finds himself alone in laughing at an image meant to invoke horror. He decides that it is best if those around him didn’t know that he was transported from an old world to a new one. I don’t know that I’ve ever had that moment, because I was born on American soil to American parents. I’m equal parts Arab-American and European-American, but because of the way that I look, I’ve had to be outspoken about my ethnic identity: it shapes the way that I see the world even when it doesn’t always shape the way that the world sees me. I’ve been told, “But you don’t look Arab.” I don’t look stereotypically Arab. I don’t look like the “big green potato” that you might’ve been shown on TV and movie screens or even in comic books, but I’m still Arab, and I’m not afraid to say that. But when I think about the people that came before me on both sides of my family, those that immigrated to the United States long before I was born here, I can imagine them making that choice when they could, choosing to distance themselves from the “Old World,” if it meant obtaining citizenship. 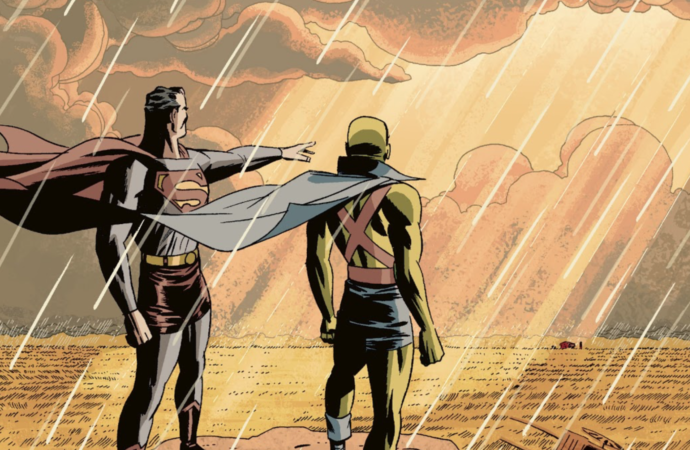 That’s why, to me, J’onn J’onzz’s story in The New Frontier is about immigration. He does what many of us do, whether we know it or not, when we consume popular media: from fiction, he extrapolates knowledge about the society that produces it. The Martian then shifts one last time before the setting of the book changes, and he becomes John Jones: a white—or white-passing—police detective. Having read it for the first time this year, I interpreted the Martian Manhunter’s narrative as one about immigration, race, and assimilation. I can write about the way that I read it, guess at the ways it was intended to be read, and argue for my own point of view. I can’t claim ownership over Cooke’s work (or his ideas or his political ideology) just for having read it. Neither Darwyn Cooke nor The New Frontier belong to me, although I do own the 520 pages on which his (and Dave Stewart’s) work was printed. My point of view meets the one that he has illustrated (metaphorically and literally) when I read his work. And in this work, the Martian shapeshifts from his traditional appearance into one that allows him to blend into American society. He consumes popular culture through his television set and the silver screen. He works as a detective because the narrative that has been mediated through popular culture and technology tells him that this is how he can be one of the good guys. He chooses to be one of the good guys, and he chooses to be white (or seen as white). And for a while, he is one of the good guys, but he is ultimately frustrated by American society and, especially, racial inequality. He is frustrated by the knowledge that he will never be totally accepted as he is, and so he tries to go home. After failing to return to Mars, he settles into a form that is more familiar to comic book readers: a man with green skin in a costume with a cape. This appearance, somewhere between Martian and human, is, I would argue, that of an assimilated superhero. Like Superman. While the Martian Manhunter wrestles with assimilation, Superman actively and unquestioningly conforms to the “American Way” for which Wonder Woman criticizes him. The New Frontier is still important today, fourteen years after it was originally published, for the same reason that superheroes remain important more than 80 years after Superman first appeared in Action Comics #1: superheroes represent the diversity of American experience. Superhero stories are fictions from which we can extrapolate knowledge about the society that produces them. 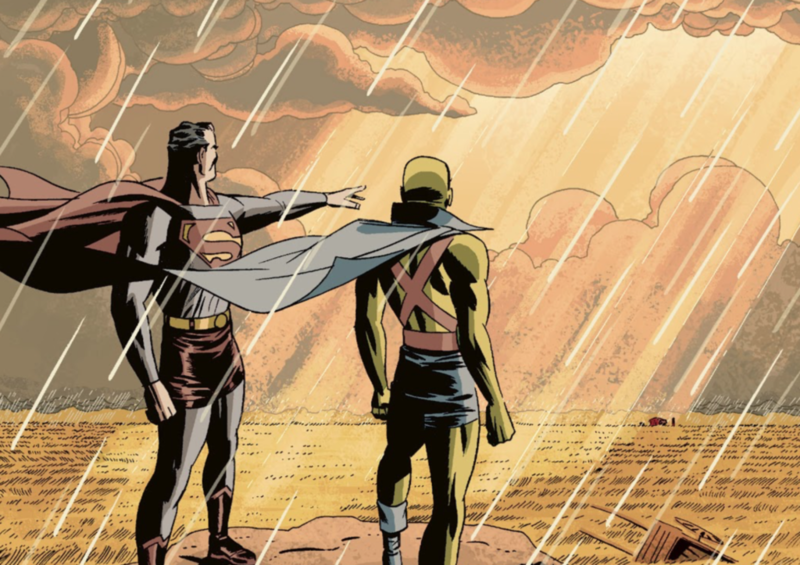 While Superman might be read as the paragon of the American immigrant experience, the narrative of the Martian Manhunter in DC: The New Frontier is one of many examples of that experience, and out of many, one: an example of those that came before me, and, therefore, mine.